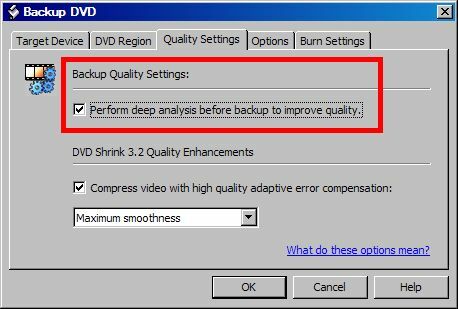 TVPast Forums | Three Important Tips for Using DVD Shrink! DVD Shrink is easy to use -- but it's also easy to butcher video by using bad settings. TV show collectors should NEVER want to ruin video! I've caught several members here making mistakes through the years. Many DVDs come with other languages -- not just English. (And since this is an English-speaking site, I'll assume nobody here cares about Spanish, French, Portuguese, Chinese, etc. I sure don't!) Pay close attention to the language when you open a disc. Remove BOTH the audio and the subtitles. You waste lots of valuable disc space by including gibberish you don't understand. DVD Shrink doesn't just shrink discs via magic. I'll spare you the crash course in video theory, but just know that digital video is essentially one big math problem. When it "shrinks" video, it takes math shortcut -- the kinds of shortcuts that would have gotten you an "F" in algebra in high school! If it saves bitrate, 2x2=3 (not 4). This is an extremely rudimentary explanation, but it suffices. Deep analysis is like checking your work. Remember those? It's still sloppy math shortcuts ... but more refined. It looks for the best shortcuts first, then implements them. By contrast, the non-deep analysis mode makes guesses as it sees new video, and creates more noise and blocks as a result. It simply looks worse. The "smooth" and "sharp" error correction (AEC) settings are misleading. It doesn't refer to how video looks at all -- i.e, you won't have blurry/soft video with "max smoothness". What the settings do is tell the math how to behave. Basically the "sharp" settings only touch I-frames and maybe some P-frames, which makes videos "pulsate" from compression. You can literally watch the GOP quality degrade every second, from good to worst. And with non-smooth settings, the "worse" is often blocky video. The "smooth" settings alter the entire GOP, reducing the bitrate evenly, thereby giving the best image quality. It's almost like a re-encode in this way. (And re-encoding often looks better than transcodes, hence the popularity of DVD-Rebuilder.) So in actuality, the "max smooth" is temporal smoothness from the transcode, as it relates to noise. "Sharp" has no meaning, and was simply the opposite of "smooth", in this (proper) context. So this is really math instruction, not visual ones. DVD Shrink was written in the era of single-core CPUs, when DVD Shrink would take hours to process videos. The more "smooth" it got, the longer it took. In the era of dual- and quad-core systems, even a "max smooth" can take minutes (under an hour for sure). If you're interested in the advanced technical aspect of how MPEG transcoding works, refer to my post at www.digitalFAQ.com. Be warned that is very jargon0filled, but also very interesting if you're into video tech like I am. As always, heavily indebted to Lordsmurf for sharing such valuable advice. Clearly you are the person I should approach for one more bit of advice on DVDFlick. Whenever I am trying to set up a menu for a disc, I know I am missing something. My subtitles overlap. For example, if the are 3 episodes of a series on the subtitle page, they overlap across the page rendering each title illegible. Please advise. And thank you so much for your guidance, past, present and future.